This item will ship on at a future date. In this new edition of the #1 Amazon bestselling ebook, veteran agents Tim and Julie Harris outline proven, step-by-step action plans to help real-estate agents pursue and achieve their dreams. Where does business come from? That’s the question every real estate agent asks but few have a truthful answer for. In an industry constantly selling the “easy button” and overrun with shiny widgets, agents are pulled in multiple directions at once, each promising that if they “just do this,” their dreams of success and fortune will come true. After 20 years in the business, thousands of home sales, and hundreds of thousands of coaching calls, Tim and Julie Harris tell the hard truths about what it really takes to make it in real estate. The new, revised edition of Harris Rules outlines specific, actionable, and proven rules of engagement that any agent—rookie or veteran—can count on as they pursue their real-estate funded goals and dreams. Harris Rules lays the groundwork, beginning with how agents need to think about the business. Moving them forward with a step-by-step action plan, Tim and Julie show agents how to create longevity by scaling the business and then teach them how to monetize it. 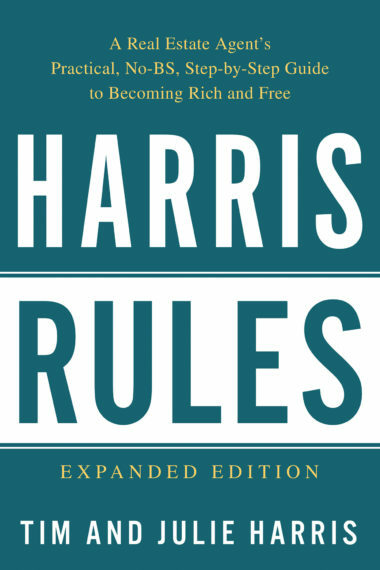 With all-new case studies, resources, and Q&As for the highly motivated agent, Harris Rules covers tricky topics with much-needed frankness: : making a profit, why having a team isn’t the “golden calf,” gaining multiple lead sources (that you don’t have to pay for! ), focusing on listings, and the fact that repetitious boredom does pay off. Tim and Julie will tell you the truth: Harris Rules is the savvy agent’s all-inclusive, no-BS guide to succeed in real estate. Dimensions: 6 x .5 x 9 in.